During celebrations such as Christmas, I often get overwhelmed with the variety of food on the table that I end up eating very little. Days after when hunger strikes but all the gastronomic goodies are gone, that's when I go back to the classic chows that never fail to tickle my tastebuds. Take this super simple snack for example. 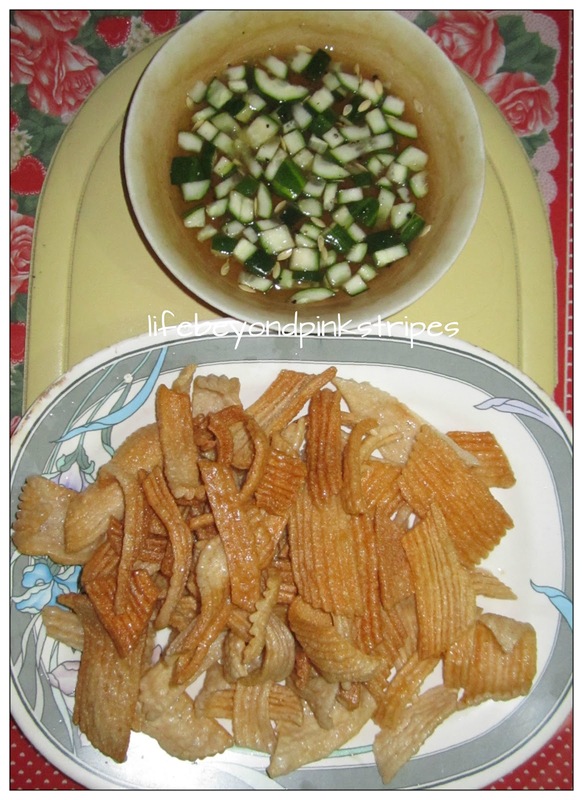 Tadaaaah...FRIED LOBSTER CRACKERS with Cucumber-Vinegar Dip. This particular type of munchies is not the usual ready-to-eat stuff. The crackers begin as pellets and then popped by frying in hot oil. 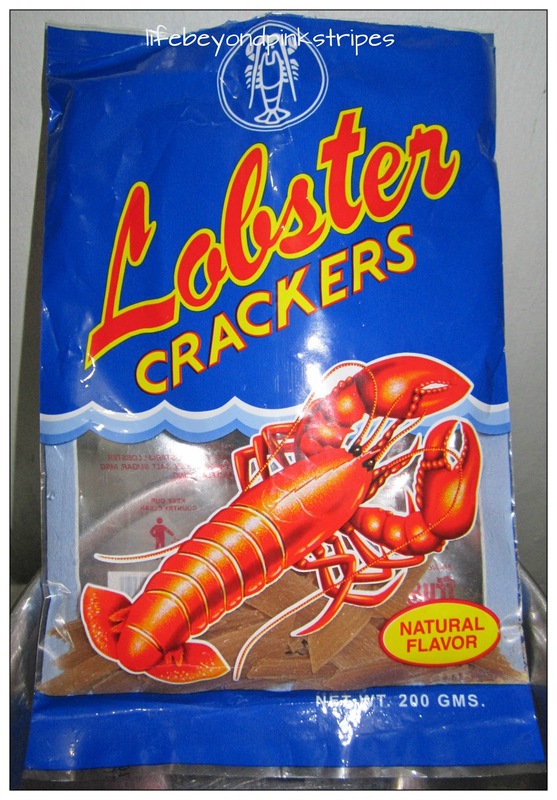 Packs of these pellets can be purchased in nearby groceries and also come in other flavors such as prawn and onion. 1. Coat diced cucumber with salt. 2. 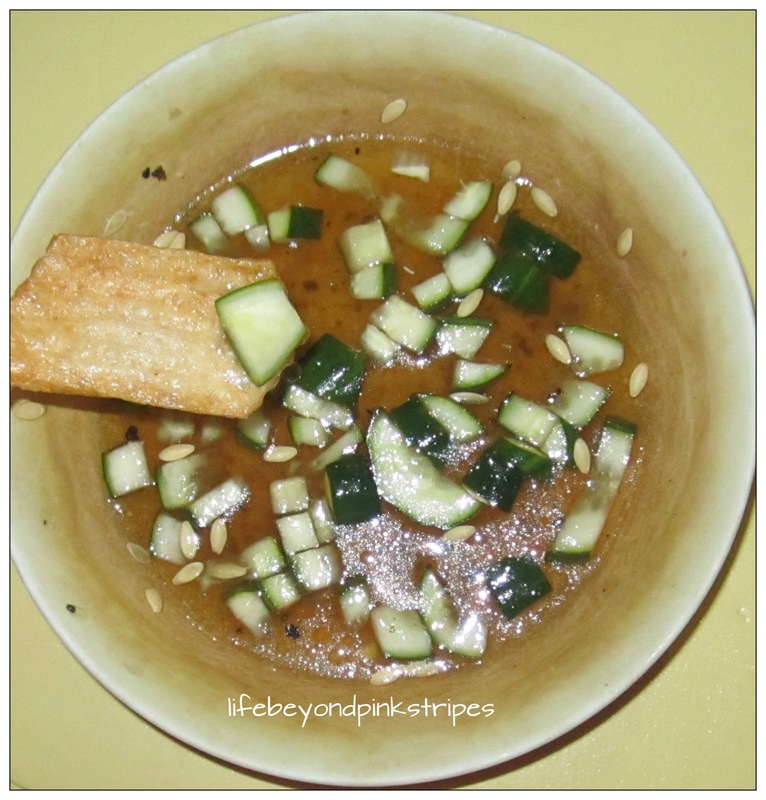 Add brown sugar and pepper to the salted cucumber. 3. Pour in vinegar to the mixture. The measurement for each ingredient is actually adjustable, depending on your taste. But ideally, the ratio of salt and brown sugar is 1:1. 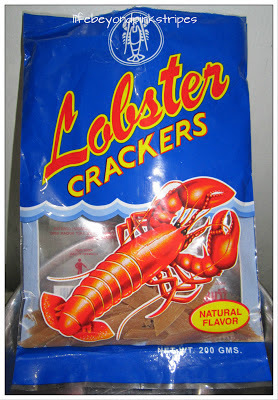 While eating, I could not help but scoop some of the cucumber pieces rather than plainly dip the lobster crackers into the vinegar. To my delight, the various flavors (sweet, salty, sour and peppery) have been absorbed by the cucumber well. This super simple snack cost me just a little over P40 (including the cracker pellets and the ingredients for the dip) or less than $1. Not bad huh!